What and why are Pacru, Shacru & Azacru? Several sellers based in USA or UK still have copies of the Pacru 302 set published in 2005 by Pacru Ltd.
Pacru Ltd ceased trading in 2014 (and not owing anyone but the owner any money) and ceased to exist as a company in early 2015. This site will remain and the games will remain and the World Champsionship continue. Mike is looking for a new publisher for the games: apologies for delay in this process. News on this should appear here first. World Championships for Azacru and Pacru will take place in Manchester England on 12th and 13th of November 2016. World Championships for Pacru & Azacru, Manchester England November 2015. 2014 World Championships took place in Manchester England for the first time in November 2013. 2013 World Championships took place in Manchester England for the first time in November 2013. Mike Wellman, author of all 3 games, participated in Shacru & Pacru but did not reach top 3 in either. the 10th Pacru World Championship was held at MSO 16 August 24th 2012: Alain Dekker champion. the 6th Shacru World Championship was held at MSO 16 August 23rd 2012: James Heppel back on top after 3 years. Korean & Japanese translations now on website. Mind Games Albury Australia, Funagain Games USA, Giochinscatola Italy, Mobius Games Japan stock Pacru as well as various stores in UK and Pacru Ltd direct. Russian distributors/game stores currently have some Pacru sets for assessment. Chinese and Swedish translations now expected during 2012. Pacru & Azacru & Shacru have been part of the International Abstract Games Organisation world tours starting in 2007 and going forwards. This rule is NOT included in the PDF's below currently but will be as soon as time allows. These have only recently been updated - please notify us of any errors or omissions. Thanks to all our translators. Full UK English pdf rules (approx 550k size) for Pacru, Shacru & Azacru. Please note that are very minor differences in wording and diagrams from the rules published with 302 set - but no difference in the actual rules themselves. How do you say Pacru (or Azacru, or Shacru) out loud? Pacru, Azacru & Shacru are fascinating and engaging mind games: board games for people who enjoy thinking strategically. As regards playing online they are free mind games, free internet games - but they exist as published board games in (currently) two versions: the exclusive and covetable 101 set (made from wood veneer, glass mosaic tiles and wooden chevron pieces) and the 302 set (colorful wooden chevron pieces and wooden markers, and a traditional folding gameboard). The games are strategy games, and can be classified under the technical title of abstract strategy board games they involve no luck and no hidden information. Well known abstract strategy games include Chess, Draughts or Checkers, Go, Reversi or Othello, Parcheesi, Chinese Checkers - most recent games of this kind have been Blokus, Through the Desert & The Gifp Series of games. Though the games Pacru, Shacru & Azacru could be seen as representing aspects of the real world, such as struggle, the spread of ideas or beliefs, territorial battles, or the Hobbesian State of Nature, etc such representation is not implicit in the rules or the game equipment. 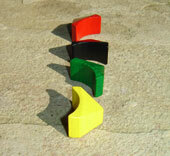 Unusually for abstract games they are good for two players, three players or four players. Most classic abstracts are about two playing gaming and the competition is more straightforward that way, but with all three distinct games in the Pacru family three player gaming and four player gaming are enjoyable and fun (though we recommend leaving three and four player Pacru till you're experienced at two player Pacru). "Gaming" is used here in the sense of playing games: not in the sense of gambling or playing for money. 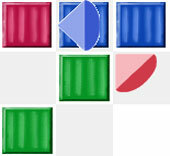 If you like playing online Chess, online Checkers or Draughts, online Go or online Othello or Reversi, online Blokus (or even on-line Risk - since you could see Pacru as an abstract version of the game world represented by Risk but without the dice) then it is worthwhile trying out our free online software or downloading it if you wish. This site is primarily about promoting the games that can be played with a Pacru set. We believe they are top mind games, cool games ... but since only invented in this century hot games also! The games are not currently mass produced so are not cheap to buy .. but making them available as games you can play for free online will hopefully spread the message. Our intention, though we cannot guarantee it, is that the games will always be here and/or on other websites offering free online gaming. We would like to make some money back from the time spent on the games, the prototypes, the manufacture, the publishing and the marketing ... we'd love the game to be a best seller ... but the main idea has always been about making the games easily available for people to play. 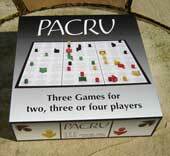 There are three different games that can be played on a Pacru set. Children from age 5 upwards can play Shacru but it probably best suits those 7 upwards. It is extremely easy to learn. Azacru requires more forethought and planning so can be played by children age 7 but age 9 upwards is a good benchmark. Pacru has a level of complexity and depth that might be seen as the same level as chess: so perhaps age 11 upwards is a good general benchmark, though again a particular child might take to it much younger (perhaps age 9 for those who particularly like games, but even younger for those who already enjoy complex games). There is no maximum age and the games can be enjoyed by anyone - young, elderly, middle-aged - from young people to their great grandparents. With each game in the Pacru family you can play the game here against the computer AI, which is at a level beyond beginner ... but likely to lose to an experienced opponent. You can also participate in games side by side at your PC or other computer with your opponent(s). The games can't be described as multiplayer since even if you had 5 sets of coloured pieces, the nine by nine squares (tiles or stars) dimensions of the game board mean that play would not work: but each game works for gaming with two, gaming with three or gaming with four. As well as playing against the computer, or playing side by side against friends or family, you can also play the online games across the internet. This is something we would like to build so there are often discount schemes on this site so that you can buy the actual board games at a discount by playing the games against opponents elsewhere on the internet. There is a yahoo group to make it easier to find players, but we would like to advance the Pacru website software to make it easier to meet up with others online. We can't make claims that the games will increase your educational achievement or your general level of mental activity or your ability in maths or spatial tasks (though we'd be very interested in any comments on that subject from teachers or academics), or that these are brain games that will make you super intelligent and successful in life. This may be true, and you may get 'brain training', expansion of mental abilities, mind quickening exercise, an increase in your intelligence, or even wisdom and insight into the human condition. On the other hand you may not. We have done no research on these things, and they were not the motiviation or impulse behind the creation of the board games. The games were invented because of a creative idea, a moment of imagination, that wouldn't go away and because the author got pleasure (joy, delight, time spent being totally aborbed, fascinated, involved) from playing games both as a child and as an adult. We have included links to reviews of the games, one of the benefits of the internet, as that may help you judge for yourself if these are games your kids, family, friends or games group will enjoy: but the free software is probably the best method to decide whether these are games for you (or possibly the photographs of all stages of particular games) Games magazine putting Pacru as runner up best abstract game for 2007 is the highest award we have yet received, and we are optimistic about more awards to come. For those who enjoy competitive events the prime UK mind game event, the MSO, is where we hold the annual world championship for Pacru, Azacru & Shacru. You don't have to be a highly skilled expert to enter the events, just an enthusiast ... and you can enter as a beginner as long as you know the rules. Better to think of more as a Mind Sports Festival or Gathering than olympiad. Most of the games at the MSO are what writers on games sometimes refer to as Abstract Strategy Games, Abstract Games. Sometimes these are called "Games of Perfect Information" or "Pure Strategy Games" though this only applies to a some "abstract" games, including Azacru, Pacru & Shacru. The key notion here is that it is all down to the skills of the players - there is no "hidden information" (cards to be turned up), there is no "luck" (e.g. the throw of the dice). There is a simple handicap that can be introduced into all three of the games which means that the beginner, or the less skilled person, can have an even chance of winning the game or gaining success against the fan or expert (see on the rules page). It is even possible to introduce the handicap in the 3 or 4 player versions of the games, although usually it is not to the advantage of two stronger players to eliminate the third player, but to play in such a way that the third player's likely moves will damage their main rival more than them. This feature makes all 3 games especially good examples of enjoyable three, or four, player board games. Although a stronger player will usually defeat a weaker one, there are elements of suspense in all 3 games. Apologies that the software doesn't yet run on all browsers. We don't charge for the sofware on the site or ask you to register - we hope that in the long run the interest in the board games will generate sales that will make this a self sustaining enterprise, and over time we want to make this one of the best internet game sites always providing free mind game online playing. If you are looking for a unique gift or special present; a game made of wood; an educational toy and game; a set of games that play well with two players, three players or four players; an attractive board game; a family-friendly game; something you can try before you buy; a present that will last (whether for a birthday, anniversary, wedding, celebation of achievement, or one of the many festivals or celebrations around the world, Chrismas/Xmas, Divali, Eid, Hannukkah, St Nicholas Day, Yule, Kwanzaa, Winter Solstice, Labour Day, Labor Day, Mother's Day, Father's Day, Easter, Summer Solstice, Spring Equinox, Autumn Equinox, Grandparent's Day, Ancestor's Day); new challenging games that are not already famous or well known, some good fun, enjoyment and pleasure; an intellectual challenge; then a Pacru set may be ideal for you. We'd rather you checked out the game and the game sets fully (plenty of links to reviews etc on the website) than bought quickly and came away with something that isn't for you. We think these are great games, top games and hope they become seen as new classic games but we don't expect every other person to agree with us: tastes differ. We wouldn't claim the games are addictive or compulsive since that doesn't seem a necessarily positive relationship between someone and any activity, but players quite happily play one game and then another and then another. If your new year resolution (or maybe one of your top ten resolutions) is to investigate a different hobby, game, pastime, intellectual stimulation then these could be the games for you. From what we've seen so far these games may appeal more to women and girls than is usual for abstract board games (though as usual the majority of the players are men or boys): but this is based on the relatively small numbers involved in game testing and competitions rather than extensive market research. Each of the games has the appeal that you are gaining territory from the start of the game. Azacru is the quickest game, generally taking from 10 minutes to 30 minutes for two, three or four player games, Shacru is generally from 20 minutes to 40 minutes, and Pacru generally from 30 minutes to 80 minutes (though it can be played rapidly with clocks and be over in 10 minutes). For both Azacru and Pacru it is generally the two player game that will provide both the quickest and the longest games - for Shacru the more players the quicker the game is likely to be. It can take less than two minutes to learn the rules in Shacru. Add another five minutes to that to learn the additional rules in Azacru. Pacru however probably needs about 15 minutes to understand the rules, so that your first Pacru game is one in which you'll probably need to have the rules, or an experienced player, by your side. Shacru is an easy game, Pacru is a game you can find hard if you're not in the mood to think about it, concentrate and plan ahead. If you want a quick game, a fast paced match, then Azacru is the best of the three (though Pacru addicts might say you could play "blitz" Pacru against the clock and finish within 10-20 minutes). If you want a slow or leisurely game (in the sense of "slow food": something to relish and enjoy) that unfolds and develops with many twists and turns at each step then Pacru is the game for you. All three are games where you will learn more each time you play and evolve new strategies, discover and develop more tactics, and where there can be unexpected and exciting shifts of fortune and advantage as each game progresses and the board changes color. We want the Pacru website to something that provides a range of interesting information in many different ways. Unusually for a game site we include a video about the game, which both assists in the never ending quest to pronounce the game appropriately, provides a rare clip of the author in somewhat confused mode, and shows something of a competition. We are looking for someone to take the computer AI much further. We are particularly interested in someone who can make a game app for the iPhone/Rim/Android etc. We believe the game with the most potential in this direction is Azacru - being a game that appeals to a wide range of players but also has interesting visual moves and a level of depth to keep all abilities of player intrigued. If you are interested and have a good programming background then get in touch. As well as being involved in developing the software for interesting, challenging, fresh and intriguing games with, in Pacru's case, a unique combination of dynamics and intense gameplay, you'll also have an unusual rewards package. This could include a share in the business for someone committed to the future of the game. Only apply if you find the games and game play attractive in themselves: this isn't the way to quick money and certainly not to a fortune. We'd love to offer more direct and immediate rewards, or to take someone on as an employee for these tasks, but that is not the stage we are at currently. On our wish list is developing software so that there is plug-in AI for rival programs, as well as developing the community and personal interaction aspects of the site. In the end we view all this as serving human to human play, and it is much more important that Pacru is available as a game to play in cafes and in public places around the world rather than at Mind Sports Competitions (or the wonderfully named intellympiads!) for international competitors. Pacru Limited endeavours to be an ethical business. At some point we hope to provide a cheaper but high quality game set partly through having some production in developing countries - but this will only be if we are sure about the labour conditions at the suppliers (we have already responded to enquiries from a Chinese Manufacturer along these lines, and strangely they never replied to our email ...), and how green their supply and manufacturing processes are. Pacru Limited would only wish to be involved in a fair trade arrangement with developing country producers. We realise that "The Beautiful Board Game" is a pretty grand claim. Many board games, particular abstract games, are very pleasing on the eye. What distinguishes Pacru and Azacru in particular is that the board is increasingly colourful as the game goes on, and that those colours are not static once in position but change in the course of the game. This is the reason we amended the header the web page to include "The Beautiful game of changes". On our wish list is an abstract video of the changes on the board through a game. Pacru has been described as a "Circular Strategy Game". Shacru and Azacru could probably not be accurately described as "Circular Strategy Games" since in each case in each case there is a good (Shacru) or reasonable (Azacru) chance that any individual game may complete without any chevron completing a circle on the board. In Pacru that is very unlikely, and usually would only occur if one player quickly captures all their opponents chevrons. The biggest attraction at displays of the game has been the glass tile version Pacru sets. These 101 sets are very desirable but also very expensive. 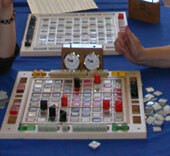 Although the 302 set is attractive during play as the board fills up some people have suggested that the board itself should be more colourful. The reason it is not is simply that it would make it harder to play - if the board itself is a colour then seeing at a glance the distribution of the chevrons and markers becomes harder. However we are considering a different board. The intriguing prototype glass tile boards using 2cm glass tiles with a bevel at the bottom unfortunately couldn't be the basis for a product distributed through shops because these tiles are subject to easy chipping if dropped on hard surfaces. The 2.5cm glass 101 tiles are much more resilient but do not have the bevel on the bottom (which accounts for the design of the well in which the tiles sit - as otherwise the tiles would be easy to place but virtually impossible to remove!). If anyone knows of a relatively damage proof 2.5cm glass tile with a bevelled bottom please get in touch. The cost of manufacturing a glass tile specifically for Pacru sets would be totally prohibitive (there are over 200 glass tiles per set so the retail price would be rather too expensive for all but millionaires), but if such tiles already exist, or are produced in the future, then a commercial glass tile Pacru board at a mass market price might be a possibility which would please the game designer greatly. Pacru 302 set runner up Best Abstract Strategy Game 2007 from Games magazine. PDF translations of the rules in six different languages on the website. Second U-CON Pacru & Azacru Michigan Open Ann Arbor USA 2007. These were the second events held associated with the International Abstract Games Association 'world tour'. 2008 - Pacru/Shacru/Azacru championships at the 12th Mind Sports Olympiad to be held Westminster in central London August 15th-25th 2008. 2008 First Abstract Boardgame Championship or Abstract Board Game Championship or Abstract Board Game Competition (or perhaps called Abstract Strategy Boardgame Championship!) as part of the MSO including Azacru and Pacru. Criteria for games included in the event will be, we believe, better drawn next year. 2009 - Mind Sports Olympiad 2009 (MSO 13 MSO 2009)dates are to be Friday August 21 2009 to (Bank Holiday) Monday Aug 31 2009 in the London area. 2009 - Pacru Championship Azacru Championship Shacru Championship were held at MSO13 end of August 2009. 2012 - Pacru seeking retail outlet for the game in Russia. 2012 - Pacru Ltd hope to announce a new game for 2014 with animal chevron pieces, working name "Animal Instinct The Game of Animal Tactics"
2010/2011 - Official Pacru rules minor change to the "meeting rule" confirmed (there have been no other rule changes since the game rules were first published on-line in 2003 and the first printed rules were issued in 2004). 2012 - Azacru, Pacru, Shacru World Championships held at MSO16 at end of August 2012. 2013 - Pacru, Azacru and Shacru world championships took place in Manchester November 2013. 2013 - Charity events giving Pacru sets in exchange for charitable donations run in Manchester November 2013 through to January 2014. 2014 - Pacru Ltd ceased trading in 2014 (and not owing anyone but the owner any money) and ceased to exist as a company in early 2015. Mike has sole copyright on Pacru, Azacru and Shacru. Mike starts (slowly) looking for a new publisher for the games. 2014 - Pacru, Azacru and Shacru world championships again took place in Manchester November 2014. 2014 - Genesis of the election game - working name "Washacru" Dec 27th 2014. 2016 - 14th Pacru WC and 11th Azacru WC will take place in Manchester in November. Random selection of quotations about Games, with some unnecessary commentary which makes this sound like the BBC radio program "Quote,UnQuote". We do not support this as advice to knock over the Pacru set during a match you are losing. Which is something that can be pointed out to any game author when they are beaten soundly at their own game. True of chess, but of course true also of any game with set rules and prescribed movements. How good only to play the games of your own choosing. visitings using this page as the access point to the site (which recent statistics suggest is about a tenth of all hits on the entire site) since 9th May 2003. This site is the official home page of Pacru Ltd who have the sole license for the distribution and sale of Pacru.